After a cooler (and wetter) than usual spring, it feels like summer weather is finally here… and with it come all my usual hot-weather cravings. I’ve been making iced tea by the bucket-load, grilling pretty much everything in sight, and on days when even the grill feels like too much work, I’ve been assembling giant (and sometimes overly elaborate) antipasto platters. 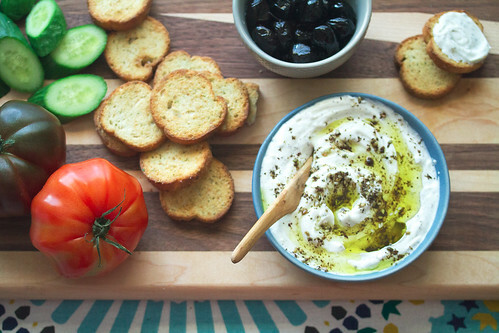 One of my favourite additions for these platters is homemade labneh, a traditional Middle Eastern dish that’s basically just good-quality yogurt that’s been strained for a couple of days until it’s thick and unctuous like a soft cream cheese, or left to strain even longer until it’s thick enough to roll into little balls. Personally, I like to strain my labneh until its texture is somewhere in between a dip and a spread. 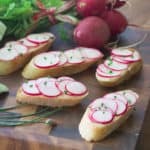 I find this particular consistency makes it the perfect addition to an antipasto platter, because it can do double-duty as a tasty dip for fresh vegetables and as a spread for crackers or chunks of bread. All you need to make your own labneh is literally three things: good-quality yogurt, good kosher salt, and patience. From there, you can serve it just as it is, or dress it up with a drizzle of olive oil and some fresh toppings. I usually use a good-quality cow’s milk yogurt as the base for my homemade labneh, mostly because it’s so readily available at the supermarket. However, this year I decided to experiment a little by using Hewitt Dairy goat’s milk yogurt instead, and let me tell you… once you go goat, you never, ummm… well, you know what I mean. I was a little leery at first, because I don’t particularly like the flavour of straight-up goat milk. However, the yogurt-making process tames the goaty funk, and leaves just a little extra tartness that carries through to the finished labneh. 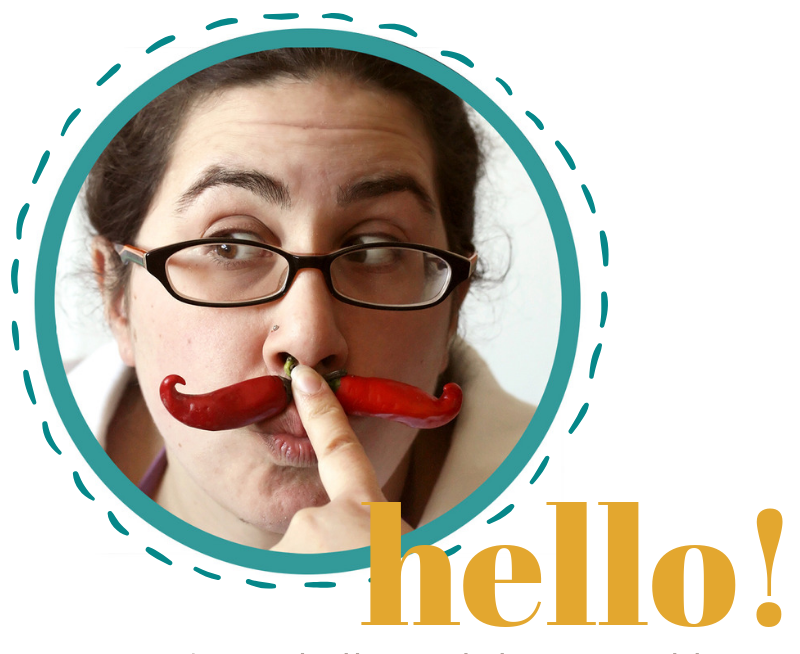 Basically, if you’re a fan chevre or other soft goat cheeses, you will love this. 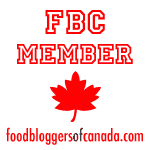 I’ve found Hewitt’s goat milk products at several health food stores in Toronto, including the Big Carrot and Noah’s. If you can’t track it down, though, feel free to use your favourite yogurt. Just make sure to use a good-quality full fat yogurt that hasn’t been thickened with corn starch or gelatin, because you won’t get the same gorgeously spreadable texture. To make your labneh into a meal (or just a really gorgeous appetizer platter for your next party), spoon it into a pretty dish and top off as you please. Then put that dish on your favourite serving platter, and surround it with a few accompaniments. Think chunks of fresh cucumber and tomato, a little bowl of olives or pickles, and some crackers or toasted pita bread for dunking. That’s usually often enough for me to call dinner, but a few slices of dry-cured sausage or your favourite paté are also nice if you want something a little more robust. Add a glass of wine and a shady spot in the backyard, and you’ve got yourself a summer spread fit for a king. Or perhaps just a really lucky goatherd. 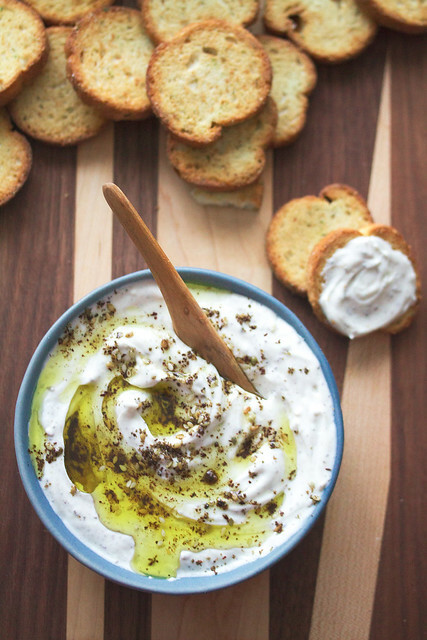 Labneh is as easy to make as it is delicious! I like the extra-tangy flavour that comes from goat’s milk yogurt, but the same technique works beautifully with any kind of full-fat plain yogurt. Line a fine wire-mesh strainer with two layers of cheesecloth and place over a large bowl. Sprinkle the yogurt with salt, and then spoon into the prepared strainer. 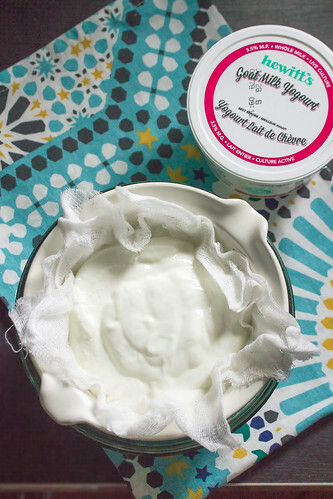 Gather the edges of the cloth and lay them over the yogurt so that it’s completely covered. Transfer the bowl to the refrigerator, and let it drain for at least 24 hours (but ideally, closer to 48-72 hours). You should have around 1 cup of liquid in the bowl, and the remaining yogurt should be the consistency of a soft cream cheese. Twist up the cheesecloth to form a parcel, and gently squeeze to extract just a bit more moisture. 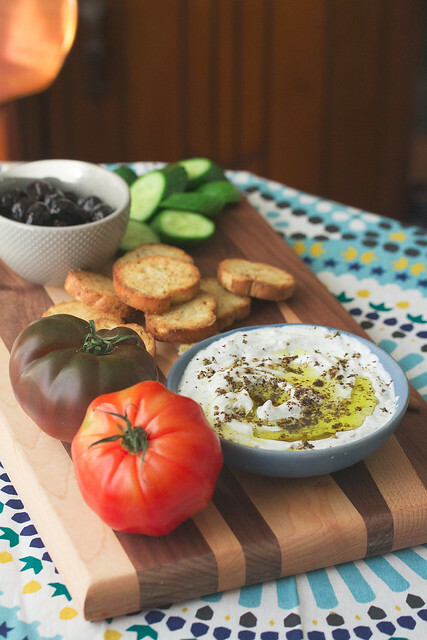 Scoop the finished labneh into a pretty dip bowl if you’re serving right away, or transfer to an airtight container and refrigerate for up to a week. 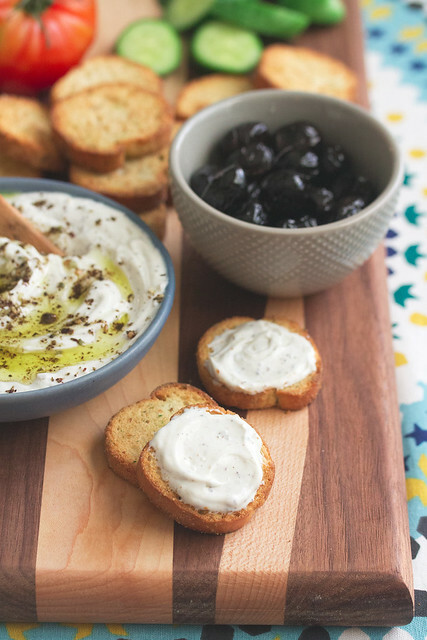 To serve, drizzle the labneh with olive oil, then sprinkle with your toppings of choice. Damn, your recipe looks super delicious. I love the mix of ingredients and how you prepare it. Thank you for sharing it with us, I’m definitely going to try it! 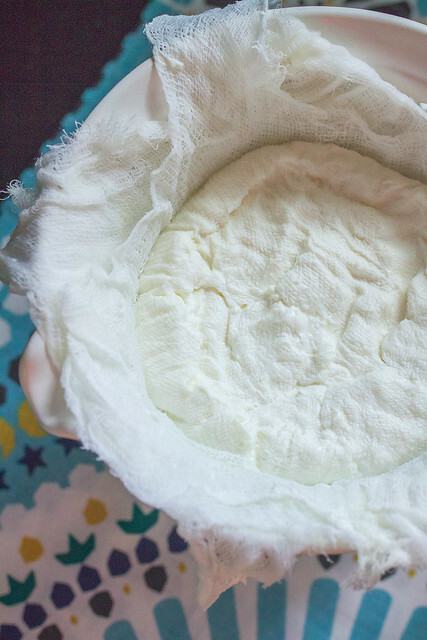 I have been making yogurt cheese for years (just not goat milk based). 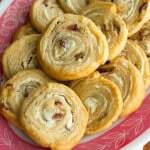 They texture works well with the antipasto platter and is a patio snack staple. Looks great. I may need to source out some goat yogurt! 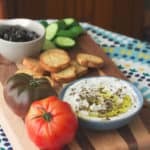 I have never made labneh, but you make it sound so easy! 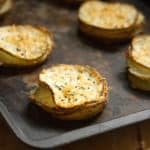 I love my antipasto platters as well, so I’m excited to add this to my dip repetoire! I am totally trying this because I’m in the land of much goat yoghurt (but it’s great we have Hewitt’s so easily available now in Toronto!). 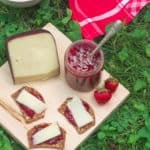 This looks like just the thing to accompany a glass or two of rosé! 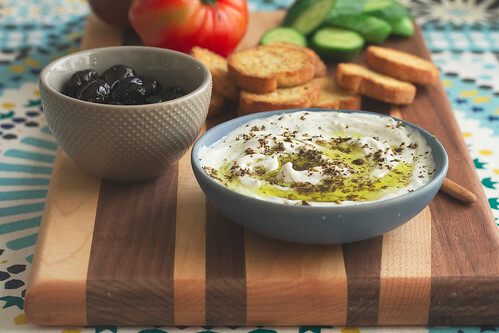 We love labneh, but never made it ourselves. There is a nice stand at the Farmer’s Market that makes a good one, so we’ve always taken the easy road ;-) . I love that you used goat milk yogurt!! Ok, now it’s time to try making our own! It looks beautiful and so delicious!